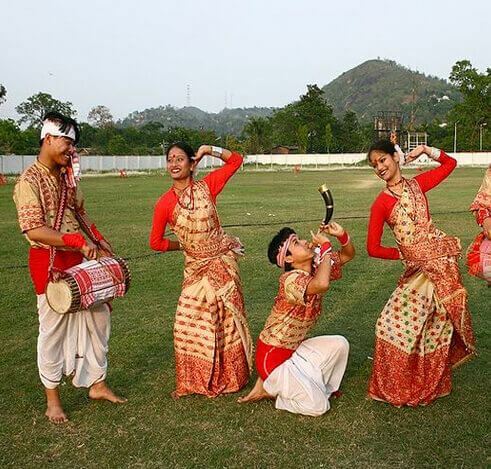 Cultural, energetic, and extremely frisky yet fun, Bihu is needless of any introduction. Mainly performed by both men and women during the Bihu festival, the dance form is all about the taking brisk steps and rhythmic movement of hand in synchronization with the hips. The origin of this smashing dance form is hardly known but as per the legends, its first official endorsement was cited during Ahom king Rudra Singha rule. Rudra Singha invited Bihu dancers to perform at the Ranghar fields around 1694 on Rongali Bihu. Since inception, Bihu has always been the one -of-its-kind and is easily recognizable by the customer and jewelry of the dancers. The male performers are seen dressed in dhotis and gamocha. Women are dressed in Chador and Mekhela. Any Bihu performance is incomplete without music. Musicians performing instruments like dhol, pepa, Taal, toka, xutuli, gogona and baanhi come together to form just the perfect beats for dancing. Not even one musical instrument can be ruled out of the list as they all play a pivotal role in producing the traditional tunes for the Bihu performance. One can expect a lot of vibrancy when it comes to the Bihu Festival.